TOKYO, Oct 12, 2018 - (JCN Newswire) - Daikin Industries, Ltd. (TSE: 6367) and Hitachi, Ltd. (TSE: 6501) announced today, as of October 2018, that they will start a joint demonstration to digitalize quality control know-how in the reaction process of chemical manufacturing, especially in fluorochemicals, at Daikin Yodogawa Plant (Settsu, Osaka Prefecture), as the second step in their collaborative creation. For this joint demonstration, Daikin and Hitachi will introduce a system that generates alarms for workers to ensure appropriate quality control instantaneously. Hitachi's image analysis technology of "Lumada" enables to visualize variety of status in reaction processes such as liquid foaming status and color change, all of which were previously checked visually by workers at certain designated points. This digitalization technology extracts the operating status data instantaneously and consecutively which leads to maintaining quality control and improving efficiency in the future. In recent years, given the diversification of customers' needs, rapid progress of digitalization, and intensifying global competition, there is a need for hi-mix low-volume production that meet customers' individual needs. In small-scale chemical production processes are difficult to be sensed using general instrumentation devices(1), quality is controlled by monitoring the production status with visual checks by workers at designated points. However, as the quality of finished products can vary even under the same manufacturing conditions-such as liquid amount and time-quality control requires considering factors that can be seen in liquid foaming state, color change, and other reaction states while the liquid is stirred, so as to improve the consistency of quality. Another issue, however, is that the frequency with which manufacturing processes can be monitored is restrained by the need to maintain productivity. Daikin and Hitachi advance their collaborative creation to achieve a next-generation production model utilizing advanced IoT. The first step of collaborative creation is to develop the "Brazing Skills Training Support System" that digitalizes brazing skills by using Hitachi's image analysis technology. Brazing skills requires advanced skills and expertise within the manufacturing process of air conditioners. The system commenced operation at Daikin's Shiga Plant from October 2017(2). Daikin is expanding applications to other locations worldwide. 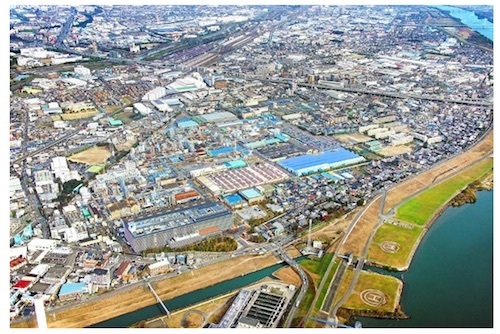 As the second step in their collaborative creation, Daikin and Hitachi have also applied Hitachi's image analysis technology and examined the digitalization of quality control know-how at the manufacturing process of fluorochemicals at Daikin's Yodogawa Plant. From the perspective of the "4Ms"; "Man," "Machine," "Material" and "Method," they have collected the time-series numerical values and image data of the reaction statuses of chemicals (e.g., liquid color and foaming) and equipment operation statuses (e.g., temperature and rotating speed) using cameras and sensors. By converting the image data to numeric data and correlating them with quality, it has become possible to establish quantitative criteria that affect the quality of finished products. Because of the criteria, the two companies gained the prospects of reducing defective rate and improving productivity and will begin a joint demonstration within the fluorochemicals manufacturing process.